The grumpy next-door-neighbour who complains to the Residents' Committee about the state of your front lawn. The man who tuts when you don't have the correct change at the checkout. The colleague who sends an all-company email when you accidentally use the last drop of milk. But beneath his cranky exterior lies a story and a sadness that is familiar to us all. And he's about to encounter a family who will change his view of the world. 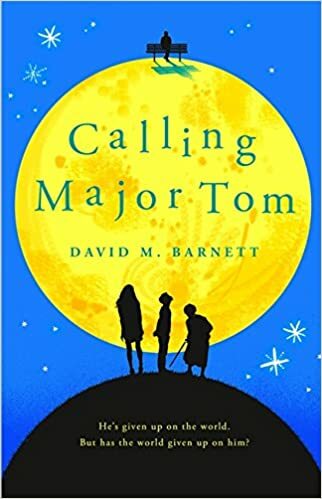 Calling Major Tom by by David M. Barnett is a somewhat tongue in cheek tale. Thomas Major accidentally becomes a spaceman who will be undertaking the first mission to Mars. Suspend disbelief for a while! Particularly as said Thomas Major is not actually an astronaut but a chemist. As the book moves on we get to learn quite a bit about Thomas and his life. Also, due to him calling a number in the UK on his iridium satellite phone, we learn about the Ormerods family. At first I felt more than a little unconvinced by this story. After all it is all nonsense isn’t it. Spacemen who aren’t really spacemen, called Major Tom, going to Mars and reflecting on their rather less than satisfying life on Earth. It did take me a little while to get into this story however I’m glad I did. While I enjoyed turning the pages through Tom’s life it was the Ormerods, back on Earth, that clinched this book for me. Gladys, Ellie and James’s grandmother, was simply a great character with some excellent dialogue. Suffering from dementia but far larger than life – even bullies at James’s school found that out! Ellie as the long suffering but trying to hold everything together teenager was well written and convincing to me. Honourable mentions for other characters too – Delil played his part well. I found some of the writing is really lovely. There is humour and sadness – indeed “mad funny sad” would probably sum this book up well for me. Despite the unlikeliness of the overall story the characters really were very good. It is one of those “warm feel good” stories and if that is not your thing then maybe this is not for you. However I’d glad I read this book.